Before I began working with Skatefresh I was a lifeguard working at a dull little indoor pool – sometimes 7 days a week!!! I skated whenever I could but I didn’t know many skaters and the ones I did know had gone back to Poland and weren’t coming back. I spent a lot of time skating alone, listening to music. Just me and my wheels! But now I have the option of skating with others and even if there isn’t anyone I know around it is easy to make friends with other skaters now I know where they are. Working towards my ICP level 1 (instructor certification course) last May was tough. And be told at the end that I had passed the exam was something really big for me. Even bigger than I realised at the time. 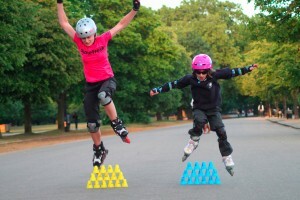 I planned to use my ICP level 1 to teach children how to skate and I was going to do this no matter what! Having Skatefresh take me on board and support me in my teaching has been a great learning process for me. Skatefresh (under Asha’s guidance) has given me the chance to discover who I am and what I really love doing. It has allowed me to go out and teach by myself. 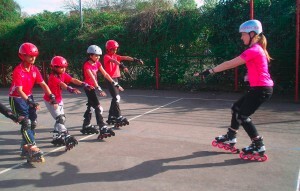 Planning my lessons and seeing success and achievement from all my little skater pupils and is really rewarding. I run skate programs at several schools in Tower Hamlets three times a week and I also give skate lessons to a group of Home Educated students. All the children I teach love skating and by the 3rd week of skate lessons they are rushing to be first to skate class, flinging their backpacks down and getting kitted up. I love seeing their enthusiasm and persistence to learn this exciting sport which is something very new and challenging to some children. I enjoy the variety of teaching locations, indoors at schools, outside in playgrounds and of course in the park. Every few weeks I teach Skatefresh’s Kids Club and love watching new children join the group and be encouraged by the more experienced ones. I also teach private skate lessons for children and have several regular clients who I get to watch improve each and every week. 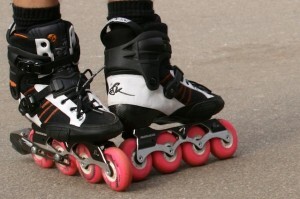 I am also lucky enough to teach children with special needs how to roller blade. This is a challenging task but one of my favourite schools I teach at. The kids are unbelievable fast learners and show me their appreciation in many different ways! To top it all of, my new Powerslide Evo’s skates are incredibly light and with the larger wheel size I am able to skate a lot faster with less effort. I have been using my skates even more than ever for transport. Thank you to Club Blue Room (somewhere I hadn’t been until I got my new Powerslide’s and now I wouldn’t go anywhere else). The knowledge the staff have at Club Blue Room is one of a kind!